It's a drag when Life gets dull. I was really excited to see that Quaker was expanding the Life line. Cinnamon Life has always been one of my very favorite cereals. Life has a wonderful texture. The pieces have a weave construct that allows a uniquely even milk absorption. With Cinnamon life, they got the flavor just right. 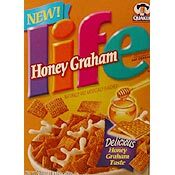 With new Honey Graham Life, they maintained the inviting texture, but the flavor just isn't very interesting. Our family wasn't poor. But sometimes when we had no cereal, my mother would crumble graham crackers and pour milk over the pieces. 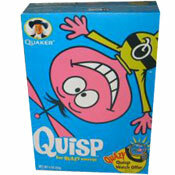 This was a far superior cereal compared to Honey Graham Life. If this new cereal was on American Idol, I would say, "I agree with Randy. You're a decent singer, but you have no charisma." What do you think of Honey Graham Life? I used this cereal to make cookies that I created but now I can not get Honey Graham Life and no other cereal works the same. WHERE can I find this in Utah? Target was the only place I could find it and it's not there anymore! Help!! I LOVE this cereal!! Our Favorite, but cannot find it anymore. Any suggestions or do they not make it anymore. I was so excited about this cereal.... but it tastes like bananas. Honestly, it does. And it makes me want to gag. I have to disagree on the negative reviews as well... although I love Cinnamon Life, when I first tried this cereal, I fell in love! it tastes delicious, and smells strongly of graham crackers when milk is added to it. I would highly recommend this cereal for anyone who loves the other versions of the Life cereal life, particularly Cinnamon or the original. I'm not too fond of the others. Only complaint? Life typically gets soggy quickly, and loses the appealing sweetened, honey-graham crunch. The milk quickly becomes delicious as a result, however! It doesn't taste much like graham, but it's delicious! Worth a few bucks to sample! It has an odd flavor that I wouldn't describe as graham, but can't quite put my finger on what it does taste like, some cross between vanilla and almonds maybe. I think this cereal is as good as regular life, but not nearly as good as cinnamon life (one of our all-time favorite cereals). Gotta disagree with the downer reviews. Not only does it have a great flavor to it, but it works incredibly well in recipes! Very disappointing. The flavor was pretty bad. I love honey graham life... much better than the other varieties (though I might have to try the crumbled graham crackers and milk thing too). Unfortunately, my stupid grocery store sells good stuff like that until I discover it, like it, and want more. Then they stop carrying it. My one complaint about life cereal would be that you must inhale it unless you want it to get soggy in the milk. It gets mushy much too fast.